Well, it has been pretty quiet on this blog for a while. It has been a busy year, including getting married, and I just haven't had the time to sit down and write up some posts. As you can see from my past postings I like to break things down with code samples and walkthroughs that let even the most inexperienced person understand what is going on, which can take some time to do. Hopefully in the future I can get a few posts up about Azure as I have been working in it a lot lately as well as some fun posts on working with the MS Kinect SDK. This blog post is actually about my latest venture, Risiti. Our goal with Risiti is to begin streamlining the retail process buy building on the relationship that is established between a merchant and a customer at the time of purchase. The first step in building this relationship is creating an electronic receipt from the merchant for the customer. This first step is complex, but extremely beneficial to the customer allowing them to no longer worry about the frustration of paper receipts. 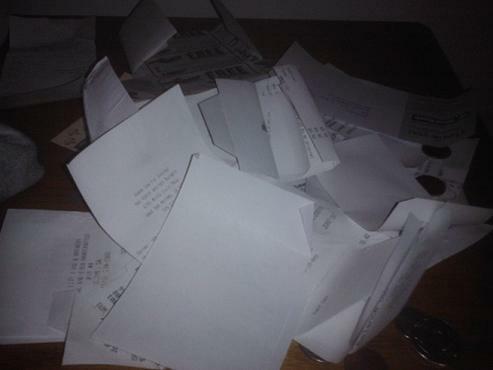 I don't know about you, but when I make a purchase the paper receipt goes directly into my wallet, then once my wallet gets too thick they move onto the top of my dresser (see the picture below of my latest pile). Finally once the top of the dresser is covered with receipts I sort them, keeping the ones that I think I still may need, and shred the rest. Rarely do I ever buy anything that I need to return, but there is always that chance, especially around the holidays. On top of that I am a small business owner and I need to keep any receipts from business expenses, not to mention needing to save them for insurance and warranty purposes. We're tackling this problem on two fronts. Our ultimate goal is direct integration with the merchants you shop at. We realize this is the best user experience for the customer, but unfortunately businesses, in general, can be slow to adopt new technologies like this so as we work on building our merchant network we are giving customers the ability to upload their receipts into the system themselves via email. If your receipt is already in an electronic format, say an email from your latest Amazon purchase, simply forward in the email to our system and it will take care of storing it for you. For paper receipts, just pull that camera phone out of your pocket, snap a picture of it, and email it in as an attachment from your phone. Whereas storing your receipts electronically is a great goal, we want to go beyond that. We want to use that information to help you build a relationship with the merchants you shop at often. From the merchant standpoint, statistics indicate that it is much more difficult to gain a new customer than it is to retain an existing customer. Based on that, we want you to be able to let a merchant know if you received a poor shopping experience so that they can correct the situation before they lose you as a customer. Beyond that we would like to work with the merchants you shop at to offer you deals and discounts that may interest you based on what you have already bought from them. Don't worry; at no point will we be giving out your personally identifiable purchase information. We want our friends and family to use Risiti and that isn't how we want to be treating out friends and family. It's a big venture that we see as being beneficial to everyone and we would really appreciate your feedback on the process. We'll be slowly sending out beta invites and making improvements based on your feedback. If you're interested in participating in the beta then head on over to the website and sign up for updates as we will be using this list to send out beta invitations. If you're not interested in participating I would still appreciate hearing your feedback on why you aren't interested. If you like the idea, head on over and like us on Facebook and follow @RisitiUSA on Twitter. Finally, when you're shopping at your favorite merchant ask them why they're not using Risiti!